Stripe dresses are just so easy to wear, you really don't have to do much for it too look effortless and nice (that's not to boost my ego, it's how I always feel how others look) so i tried to re-create the looks that've seen around the internet. I added the shirt and tied it round my waist, because one it was far too hot to wear, two I saw somewhere that sometimes it adds a bit outline and three Emily (shay mitchell) from pretty little liars is always wearing shirts around her waist and I absolutely love how she looks when she wears them like that! Before taking these photos we walked all the way up this massive hill that was next to the pool at our hotel just to see where it lead to and Sam on the way back down saw these pile of rocks and couldn't resist climbing up them, just like he did with a massive rock we found in a secluded beach and look at his grin when he managed to sit there! I was less smiley but that was probably due to the fact that every time he moved the rock wiggled and I did fancy a trip to the hospital, I don't think he'll ever really grow up and always climb anything he can. Your dress is so simple I love it! 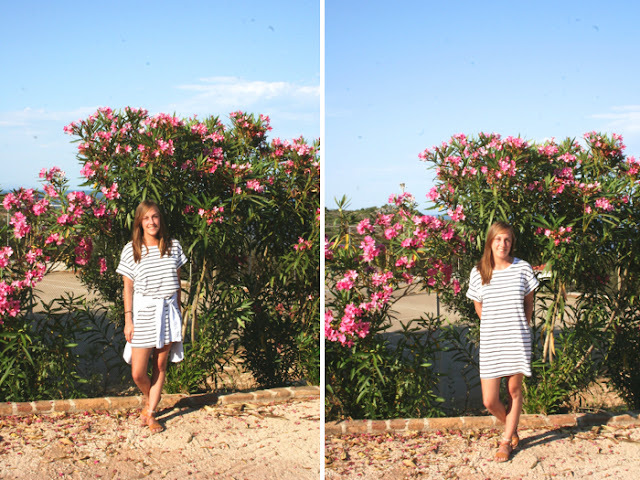 Love the simplicity of this dress - I am all about stripes at the moment!